One problem encountered by most of us who are working with fiberglass resin for the first time is that we are a little slow, perhaps because we are initially unsure of what we are doing, and the mixture may set up in the glue pot. A solution is to extend the pot life of the mixture by substituting a different hardener. We use West System No. 105 resin and No. 206 (clear) hardener. No. 205 hardener (amber-burgundy color) gives significantly less working time before it begins to set up, about half that of No. 206 hardener. All you need to begin that fiberglass layup! Whatever resin you use, it is important to protect your skin from contact. I prefer to use "Invisible Gloves" No. 1211, a formulation from Sun Magic International located in Florida, and available from Wicks and probably Aircraft Spruce. It's convenient, comfortable, and the resin won't touch your skin, only the protective coating. The problem I found with latex gloves is that my hands would sweat, and when I lifted my hand the sweat ran out of the glove, down my arm, and dripped onto my work. Some people have reported allergic reactions to fiberglass, although in some cases I am not sure if it is the fiberglass or the resin that is causing the problem. 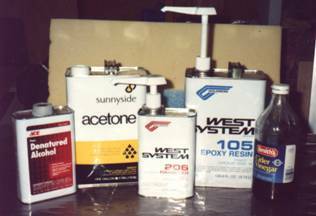 I was told that Larry Burton developed an allergy to Safe-T-Poxy and therefore switched to West System epoxy. In any case, a dust mask will help prevent the inhalation of glass fibers. Long sleeves and latex gloves can help prevent itching. Although I have allergies, I'm not allergic to the fiberglass or the resin--it's all those "natural" plants, molds and dust out there that cause my problems. There are several types of foam available for homebuilders to use for core material in fiberglass construction. The blue type that is cut with a hot wire is Styrofoam®. People often associate Styrofoam® with picnic coolers and coffee cups, although the latter have not been made out of Styrofoam® for a number of years. Aircraft Styrofoam for a fuel tank plug. 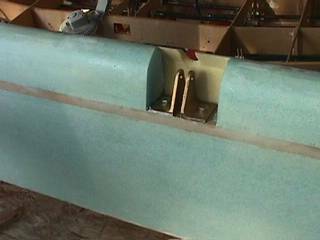 (polyurethane will be used for the actual fuel tank and baffles) Styrofoam is easily cut with hot wire. Although it's nice and light and easy to work with, Styrofoam® can be dissolved by petroleum products such as gasoline. Therefore it cannot be used for fuel tank construction and should be kept away from areas where fuel might contact it. Also, Styrofoam® cannot be used with either polyester or vinyl ester resins. It is only compatible with epoxy resin. Polyurethane foam is used for all the foam parts of the Marathon and Celerity, unless you decide to cut some Styrofoam® with a hot wire for use in leading edges, controls, or to make fuel tank forms. Caution: you cannot cut polyurethane foam with a hot wire--it will emit a poisonous gas if you do so. 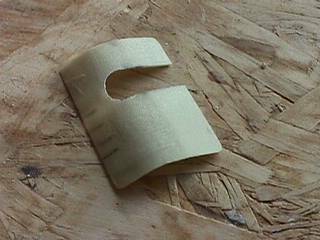 However, polyurethane foam cuts easily with a knife, and it can be shaped with light sandpaper, or even with another piece of the foam used as a sanding block. Two fuel tank baffles covered with epoxy resin and fast hardener. A foam blank is shown at lower right, and glass cloth at top right. Other foam materials that are sometimes used for homebuilt aircraft construction include Divinycell® and Klegecell®. I have not used either one of these polyvinyl chloride type foams so I cannot comment on them. Putting it all together: foam plus fiberglass equals one strong airplane! If you apply fiberglass to both sides of a polyurethane foam core, the combination of the two materials increases the strength by a factor of three, and the stiffness by a factor of seven, with only a few per cent weight increase. And if you increase the thickness of the foam core, the increase in the strength of the completed, fiberglassed piece is almost an exponential function! (i.e.--double the thickness and you almost square the strength, with very little weight gain) We specify 1/4 inch polyurethane foam for the skin on the wing, vertical and horizontal stabilizer, 1/2 inch polyurethane foam for the turtle deck and canopy area, and one inch foam for the fuselage sides and bottom. 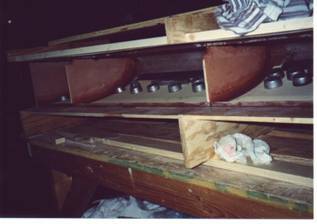 One inch thick foam is glued directly to the fuselage plywood, and does not need a layer of fiberglass applied to the inside surface. However, all the rest of the foam sandwich panels used on the wings, tail and turtle deck must have one layer of fiberglass applied to the inside surface and two to three layers applied to the outside. Before applying resin and glass cloth to the foam, you should seal it first to prevent it from soaking up too much resin and becoming heavy. Mix up the resin and hardener, and then add an approximately equal volume of microballoons to make a slurry seal. Apply this slurry over the entire surface of the foam panel before applying the glass cloth. The microballoons will help prevent the foam from soaking up the resin and will keep your structure strong and lightweight. I like to apply the slurry with a rubber or plastic squeegee, as it helps push the slurry down into the foam a bit. Do not let the slurry dry before applying fiberglass. Apply the first layer of glass cloth right over the wet slurry and squeegee it lightly from the center outward to help embed the fibers in the slurry. Try to run the squeegee along the directions of the fibers so you don’t pull the glass cloth out of shape and disturb the orientation of the fibers. Fiberglass cloth is laid with its strands running at a 45 degree angle to the longitudinal axis of the piece, for two reasons: it provides more strength in the desired direction, and the cloth will follow the curves (such as a leading edge or wing root) much better. Now apply the straight resin and hardener mixture (no microballons) to the glass cloth. Use a squeegee to pick up excess resin and return it to your cup. 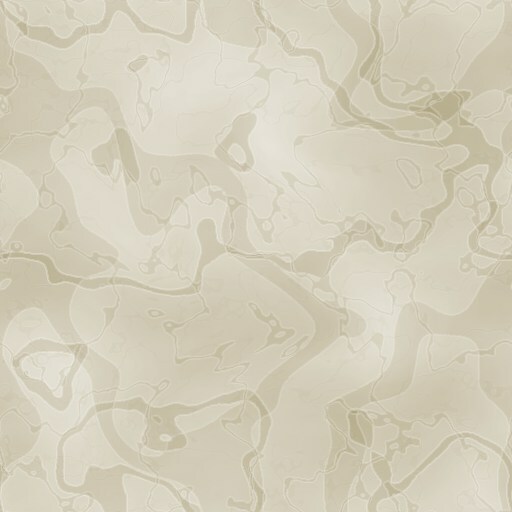 Whitish appearing areas are resin starved--apply a little more resin to these areas. The inside of a fiberglass, leading edge fuel tank, turned upside down. Polyurethane foam panels are weighted down with lead and will be covered with fiberglass to add stiffness to the fuel tank wall. The baffles (i.e. ribs) are epoxied in place. Sometimes you have to force the resin down into the cloth to thoroughly saturate it and get rid of the whitish cast. Stabbing motions with a resin wetted paint brush (called "stippling") will work very nicely, although sometimes a squeegee will do. 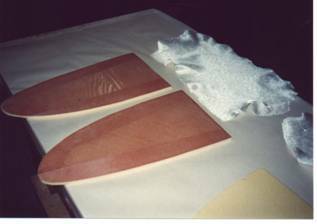 Do not worry about making a smooth finish when you are fiberglassing. If you try to do that, you will apply too much heavy resin, which will add weight but not strength to your airplane. Just work fast, remove the excess, and get it done. Later on you will apply filler and sand it down to the glassy, perfectly smooth skin that catches the eyes of the judges at Oshkosh. If you find that you're not working fast enough to prevent the resin from reacting in your mixing cup, you can delay the onset of the reaction by keeping the resin cool. This is most easily accomplished by using a wide mixing cup that presents a lot of surface area to the atmosphere for cooling, and by only mixing up a small portion of the resin and hardener at a time. West System 105 resin and 206 hardener gives you a pot life of 20 to 25 minutes at room temperature. However, according to the directions this mixture must be applied at an ambient temperature of at least 60F, or 15.5C. The faster hardener (No. 205) can be applied at cooler temperatures, as low as 40F, or 4.5C, but its pot life is approximately half that of 206 hardener. If it's hot (warmer than 72F) you might want to set your glue pot in a shallow pan of cool water to delay the reaction of the resin and hardener. 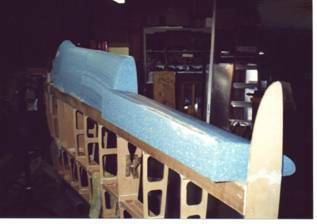 This aileron has been fiberglassed. At this point I am making covers for the hinge access cutouts. As you can see, I used the slow (clear) hardener here. Overlap adjacent pieces of glass cloth by at least an inch, and put dacron peel ply tape on the overlap to smooth it out. Also use peel ply in corners where strips of reinforcing cloth will be applied later on. Remove the peel ply the next day. If you can, it's best to completely finish a fiberglass layup in one work session rather than coming back to apply another layer later on. As it sets up the resin exudes a sort of waxy type material that must be thoroughly removed from the surface before applying more fiberglass. Scuff each layer with medium grit sandpaper and clean it with acetone or MEK before applying any additional resin or cloth. Just be careful that you don't sand down into the glass cloth fibers, as it will compromise the strength of the material. This cover for the aileron hinge access hole is made from the material that was carefully cut out of the slot. Some foam remains on the inside of the piece. It will be screwed to small wood blocks epoxied at either end of the open slot. This is an admittedly quick look at composite construction. It's fun, and also gratifying when you see the results. With a little more knowledge you're ready to go out there and try it yourself! Our Celerity and Marathon Builder's Manuals include more detailed instructions on composite construction for the new builder, and Construction Video No. 2 includes a segment on fiberglassing. This demonstration was by someone who was not experienced, so you can see how another first-timer handled it. We have produced a video, "Easy Fiberglassing", which is Number 6 in our Celerity/Marathon construction video series. This one emphasizes fuel tank construction for the new builder. Also, if you are a beginner, I highly recommend the EAA video, "Basic Composite Construction", and in about 35 minutes you will learn more about fiberglassing than just about anywhere else in the world! Mike Toft reports that he may be able to fly his Celerity with its unique Cadillac Northstar engine in the next year. I sincerely hope so, as the interest in auto engine conversions is intense, and his chain drive PSRU will generate a lot of interest on its own. 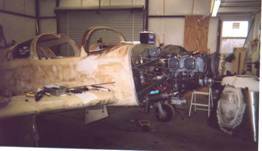 Cyril McLavin reports the following regarding the engine proposed for the Celerity he is building: "Hi Eldon, Delta Hawk .com is my engine of choice approx 160 hp 4.5 gals/hr cruise no mags cam etc. turbo and supercharger so no glow plugs and 20k. + altitude with full power price is about $20k. Runs on jet A or auto diesel and mixable. Hope to hear from you soon. 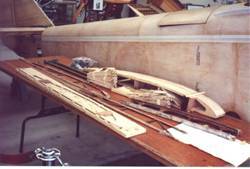 Cyril" Tom Allison wrote concerning his Celerity project he bought from Bob Bowers while at the Copperstate EAA fly-in a few years ago. "Dear Eldon, Here's a photo of the plane, you can see how far along I am. Tail feathers are done and closed out. Hooking up the left aileron and the controls will be finished. Hope to fly soon and also out that way to the fly-in. If you get a chance call Bob Bowers and let him know. I'll be calling you soon. 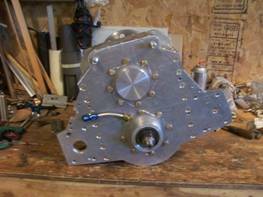 Tom"
Tom Allison's Celerity with Lycoming engine installed. Note completed cowling at right, standing on the shop floor.